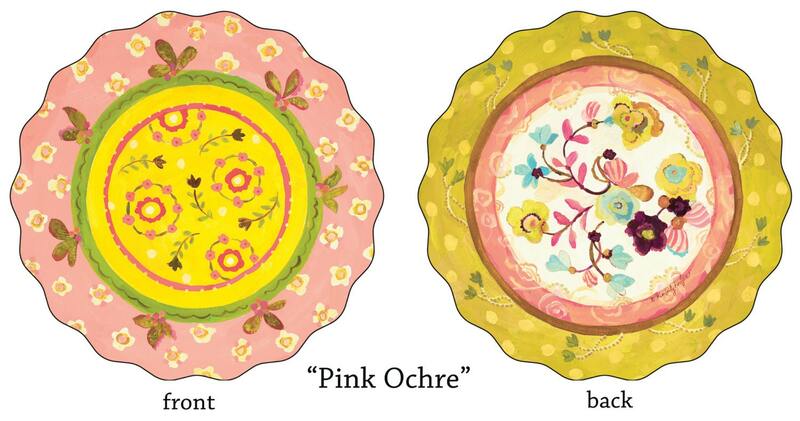 Pink Ochre Reversible Paper Placemats by Kimberly Hodges. 25 paper placemats to grace your holiday or wedding table. A generous 13" round diameter. They have other uses as well so put them to work in your card making, serving up baked goods, using for a lasy susan liner, pet placemats, hostess, birthday, or wedding gift, gift wrapping or packaging, or as scrapbook or photo round frames. This particular Lovebird design makes for an especially sweet gift for someone getting engaged or married. Very pretty, exactly what I was hoping for.